In response to a request from Nuclear Watch New Mexico, the National Nuclear Security Administration has released to us expanded versions of the 2012 Performance Evaluation Reports (PERs) for seven nuclear weapons complex sites. (The report for the Savannah River Site was not given to us.) The reports are used by NNSA to decide how much Award Fee it will give its nuclear weapons site contractors each year. It turns out that cyber security for running supercomputing networks at a national nuclear weapons laboratory may not be much different than cyber security for the rest of us emailing, social networking, and watching kitten videos. All of us need to reasonably vigilant with passwords and software updates. The difference is that when you and I use lame passwords and don’t update our software, we don’t put national security at risk. The DOE Investigator General (DOE IG) released a report that identified continuing concerns in LANL cyber security program. These concerns have been going on for years. A 2006 report revealed that critical cyber security internal controls and safeguards were not functioning as intended and monitoring by both laboratory and Federal officials was not adequate. Weaknesses with LANL’s cyber security program were also identified at least as far back as 2002. How do you spell PASSWORD? The DOE IG found that, “Network servers and devices were configured with default or easily guessed login credentials or required no authentication. For example, 15 web applications and 5 servers were configured with default or blank passwords.” Additionally, two network servers had the possibility to accept connections from anybody without the use of authentication or similar access controls. Also, 10 network servers could have allowed unauthorized remote control. And, “LANL had not fully implemented existing security patch management and vulnerability management procedures. Specifically, tests of 191 network servers supporting LANL’s financial applications and data or providing core network services revealed that 73 (38 percent) were running operating systems and client applications without current security patches…” The DOE IG also found that LANL continued to maintain a significant number of operating systems, client applications and other various software that was no longer supported. To be fair, the DOE IG reported that LANL “improved the protection of national security systems and data through the elimination or disablement of data ports on machines containing classified information.” This partially refers to the Lab’s low-tech program of injecting a popular two-stage epoxy into USB ports. I’m not sure that qualifies as an IT solution. No passwords. No updates. How does this happen at nuclear weapons laboratory? Two things – First, the Lab contractor does not perform. Second, oversight is lacking. The DOE IG stated that, “The issues identified occurred, in part, because of a lack of effective monitoring and oversight of LANL’s cyber security program by the Los Alamos Site Office, including approval of practices that were less rigorous than those required by Federal directives. “ The Los Alamos Site Office is a DOE office and is tasked with providing immediate federal oversight of the Lab and making sure that our taxpayers’ dollars are spent wisely. Unfortunately, DOE continues to relax its grip of oversight of the Labs. Continuing cyber security issues are only one manifestation of this letting go. We need a strong DOE Secretary, a strong NNSA administrator, and strong Congressional oversight as we head towards zero nukes if we hope to hold the nuclear weapons complex contractor accountable. Read the Global Security Newswire Article here. February 15, 2013 August 28, 2018 Environmental Impact, Los Alamos Nat'l Lab. On January 22, 2013 representatives of the Los Alamos National Laboratory discovered the presence of a diesel spill from an above ground storage tank system at the LANL Technical Area 55. The spill was from the new Radiological Laboratory Utilities Office Building’s (RLUOB’s) 12,000-gallon emergency generator diesel storage tank. The RLUOB is the recently completed first phase of the CMRR project. The main phase of the project, the CMRR Nuclear Facility (estimated at #6 billion), has been deferred for at least 5 years and will probably next be proposed next as a smaller project, if at all. ank Bureau are working to figure out if more soil needs to be removed. Santa Fe, NM – According to a major article published today by the Center for Public Integrity, the Obama Administration is preparing to release a long-awaited “Implementation Study” as a follow on to its 2010 Nuclear Posture Review. This study will reportedly lower the number of deployed strategic nuclear weapons to 1,000 – 1,100 from the 1,550 each pledged to by Russia and the U.S. in the New Strategic Arms Reduction Treaty arms control agreement. In December 2010 the U.S. Senate ratified New START, which Republican senators used to extract funding commitments for “modernization” of both the nuclear weapons stockpile and the National Nuclear Security Administration’s research and production complex. Nuclear Watch New Mexico applauds further cuts to strategic nuclear weapons as an excellent step in the right direction. But as the Center for Public Integrity points out the Obama Administration considered but rejected a “deterrence only” nuclear posture that would require only some 500 warheads to back up the officially declared policy of deterring others. This is in contrast to the 1,000+ weapons needed for nuclear warfighting and first strike capability (which the U.S. has never renounced). The U.S. has officially and repeatedly declared to the entire world (notably at the United Nations’ 2010 NonProliferation Treaty Review Conference) that it will not produce new-design nuclear weapons. Simultaneously high-level government officials also pledged that the U.S. would never give existing nuclear weapons new military capabilities. As a case in point for the need to preserve the tested pedigree of the stockpile, the new-design fuze for the W76 (in part responsible for its new military capability) had initial design problems that delayed start up of its Life Extension Program. Future LEPs could be even more aggressive, with for example a proposed joint warhead replacing both the W78 ICBM warhead and the sub-launched W88 while using the plutonium pit core of yet a third type of warhead. This inevitably raises the question of at what point does a reputedly refurbished nuclear weapon become a “new” weapon, directly contradicting officially declared policy and creating a terrible proliferation example. This is from our friends at Hanford Challenge (www.hanfordchallenge.org). Bechtel is the major operator of Los Alamos National Laboratory. Seattle, WA: Hanford Challenge today released a high-ranking Director’s memorandum that urges termination of the key duties of government contractor, Bechtel National, Inc. (“Bechtel”; “BNI”). A litany of charges question whether Bechtel should continue its role at the Hanford nuclear site, including a long history of incompetence, misleading the government, overcharging, and unsafe designs. The Hanford Waste Treatment Plant is one of the world’s largest and most expensive environmental remediation projects. The current plant is the fourth attempt to build a treatment facility to convert radioactive waste into glass at Hanford, it is a decade behind schedule and with a price tag of approximately at $13 billion, it is at least 250% over budget. The Department of Energy (“DOE”) recently suspended much of the project’s design and construction activities, pending resolution of outstanding safety and technical concerns. Trinity Day — a good day to get money from the Fed? Yesterday was the 67th anniversary of the very first atomic bomb test in the New Mexico desert, and alas for us, it was a success. Across the globe, we still have 20,000 bombs ready to go, many of them on high alert. Commemorating this event and its consequences were three different developments in New Mexico. The first and most incongruous was news of a delegation embarking on that very day and heading to Washington, DC, to sell someone (not specified in the Los Alamos Post story) how much it means to the state of New Mexico to have the Labs here. Nice way to celebrate the anniversary, que no? Drinks afterwards at the Capitol? The delegation was composed of nearly 20 members of the business community accompanied by a representative from Governor Martinez’ office. We might have expected the head of the Chamber of Commerce, Simon Brackley, to be there, but it was a bit of a surprise to see Lilian Montoya Rael, a Board member from Christus St. Vincent’s Hospital. But I suppose that the Labs, being so detrimental to health, are an indispensable asset to the Hospital. Speaking of health, the second event, in marked contrast to the humble fundraising efforts of a few of our respected citizens, addressed the reality — the real impact of the bomb test on the lives of citizens, in this case the citizens of Tularosa, a small village that exists outside the presumed boundary of fallout that was expected from that event. These men, women and children have experienced a disproportionately higher-than-ever rate of cancers and other disabling conditions. July 16 was named Nuclear Disasters Day in Tularosa. They celebrated with luminarias at the town baseball field! And which way will it go? Will the delegation of business people receive more money from Washington to produce more bombs, an activity so lucrative to the state that they can’t bear to let it go… or will this year be the year of The Rise of the Little People demanding an end to this profligacy and waste? Stay tuned. Alaric plans to fast until Nagasaki Day, August 9, anniversary of the day in 1945 when the US used the first plutonium bomb against the residents of that city, killing 130,000 on site and more later. Enough, he says, and we say with him: Let’s have a Change of Heart, For a World of Beauty! Raise an empty glass with 30 hunger strikers and join them if you wish: you’ll find them on Facebook, at Los Alamos Hunger Strike. STANDING AT THE GATES OF THE LAB some 20 protestors, most of them from Trinity Abolition, an Albuquerque group which protests at the Lab on a regular basis, as well as members of the hunger strike, joined hands outside the gates of the lab. “Lab people came down and took our pictures and got our names,” reports Ellie Voutselas of Pax Christi, one of the fasters. Alaric then moved over to Ashley Pond, the original site of the Lab and now a public park, where he was joined by a young striker whose dog set up a howl for the duration. Guess that puppy has a few things to say about nuclear weapons, but the canine may provide an unneeded distraction if this keeps up. There has been much in the recent news about Los Alamos National Laboratory underestimating how much radiation could leak from the nuclear weapons production plutonium lab after a major earthquake and fire. Read the POGO article here. The Defense Nuclear Facilities Safety Board Report is here. Among other problems, LANL computer models credited sheetrock walls with surviving an earthquake. In a recently released May report, the Department of Energy’s very own oversight Department finished a separate review titled, “Independent Oversight Review of Site Preparedness for Severe Natural Phenomena Events at the Los Alamos National Laboratory”, that also questions the Lab’s safety procedures. The Health Safety and Security Office (HSS) of Safety and Emergency Management Evaluations performed this independent review to evaluate emergency response capabilities at the Lab and how the Lab maintained them in a state of readiness in case of a severe natural phenomena event. The review showed that LANL would have trouble responding quickly with the appropriate emergency response in the case of a serious natural event. • Do not use the PF-4 criticality alarm system as an Emergency Action Level entry indicator for the criticality event analyzed in the TA-55 Emergency Planning Hazards Assessment. In addition, the Lab’s generic natural disaster Emergency Action Levels do not provide sufficient information to accurately categorize and/or classify a severe natural phenomena event. And LANL’s planning for onsite protective actions and offsite protective action recommendations provided in the Emergency Action Levels did not fully consider facility or site conditions for the analyzed events. The report continues. The Independent Oversight observed outdated and incorrect information in the current set of CMR and TA-55 PF-4 Emergency Action Levels. Further, the generic Emergency Action Levels for severe natural phenomena events were not based on the potential for or an actual uncontrolled release of HAZMAT and are not linked to protective actions or protective action recommendations. Additionally, the pre-planned protective actions for a TA-55 PF-4 seismic event are limited to shelter-in-place when there could be high radiation levels, and no effective shelters are available. So, we have two different government agencies questioning safety after the Lab received a record $83 million in award bonuses. These reports are another example of why the Lab must shut down plutonium operations now. In an April 20, 2012 report, the Safety Board charged with oversight of defense nuclear facilities reported that the system used to track nuclear materials in the Plutonium Facility at Los Alamos National Laboratory was operating erroneously. The system apparently only kept track of 1,700 out of 13,000 containers of nuclear “materials at risk” (MAR). This omission caused the facility to exceed its limits for MAR located in individual containers and outside of gloveboxes at least 15 times. If one is operating a facility with large quantities of fissionable nuclear materials it is very important to know where the materials are at all times because stacking too much plutonium in one place can cause a criticality event or worse. After the error was noticed, the Lab manually started to verify container MAR amounts manually. “To date, fifteen containers, all housed in the facility’s vault, have been identified with contents that exceed the MAR limit of 7500 g WG-Pu [Weapons Grade Plutonium] equivalent.” That’s a lot to lose track of because these limits help the facility to comply with the seismic requirements of operations in the Lab’s earthquake fault zone. Normal operations have been terminated in the 150,000 square foot Plutonium Facility and the facility has been placed in “Standby Mode.” How much does a shutdown cost taxpayers? How long has the Lab violated these limits? The report states that the tracking error was introduced during software development, apparently due to a “miscommunication” between the software developers and the security personnel. The MAR tracker program performs other required MAR limit surveillances in the facility. Are these other surveillances reliable? This incident also calls into question other Lab software, such as programs that model contaminant transport. It is unclear if the plutonium facility has restarted operations. The Safety Board reports usually are released about a month after they are written. The Defense Nuclear Facility Safety Board Report is here. I’d like to respond to the news stories out lately concerning the Director’s salary at the Los Alamos National Laboratory. Following our press release Wednesday, the Lab released their reply. It was reported by both the Albuquerque Journal North and the LAMonitor. BTW, it’s not our “computations.” The compensation levels we quote come from federal reporting on economic stimulus funding. In response, the Lab states, “The majority of the figure reported under DOE stimulus funding guidelines is an increase in pension value.” Can anyone explain what this means? Our economic experts are at a loss. Until I am straightened out, which I eagerly await, the statement will mean to me that the increases of the Director/President’s annual compensation are mostly due to increased pension contributions. Whatever it is, it is still annual compensation. The Lab response continues – “Also included are salary, life insurance, health benefits, and other total compensation.” I repeat, whatever the “increase in pension value” is, it is still annual compensation. 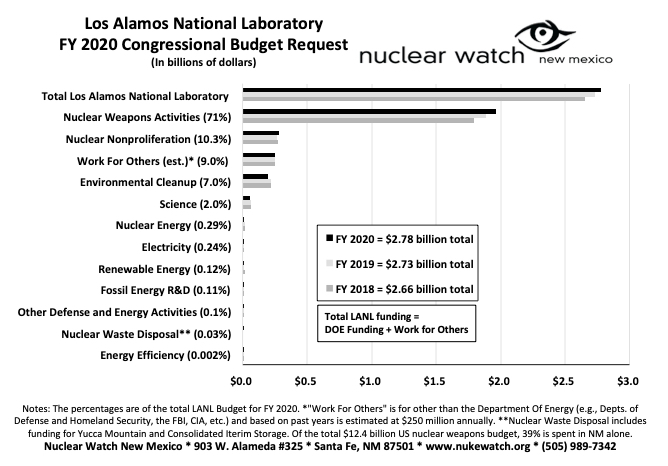 The Lab response continues – “The portion of the director’s annual salary reimbursable by the government is about 35 percent of the reported figure and is comparable to previous director salaries, adjusted for inflation.” That may be true, but the remaining 65% of the $1M annually going to the LANL Director/LANS President is coming from the contractor Los Alamos National Security, LLC (LANS), of which he is president of the executive committee of the board of directors. The statement continues – “Any amount above the federal maximum comes from LANS performance fees and is not reimbursable by the government.” But the LANS performance fees are paid by the federal government, so ultimately it is still the taxpayer that is paying the LANL’s Director’s total salary. It is still annual compensation paid for by the taxpayers. Before the LANL management contract was privatized and became for-profit in June 2006 the LANL Directors were getting just that salary directly reimbursable by the government. Now they get that plus the larger LANS amount on top of it. which will likely lead to its termination. 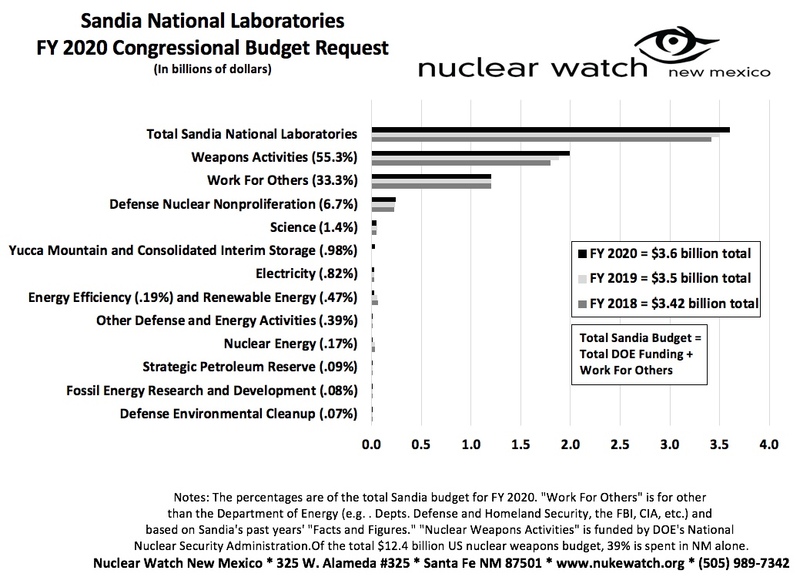 Coincidentally, Nuclear Watch New Mexico had been independently compiling data on the salaries of the three laboratory directors, as presented in the table below. It shows that the salary of the Los Alamos Director has nearly tripled since for-profit management began in June 2006, even as the Lab is cutting some 600 jobs. As seen below, privatization of the nuclear weapons labs’ management contracts has resulted in directors’ salaries far above average in both the federal government and the private sector. Diminishing Public Accountability. Without a strong yardstick, our government cannot govern well — not even if it retains the best and brightest on contract. The government’s own assets must capably bear the responsibility for decisions that affect national interests, and they must maintain public confidence by the manner in which those decisions are made. In contrast, the directors of the three nuclear weapons labs (the Los Alamos, Sandia and Lawrence Livermore National Laboratories) wear two hats, first as lab directors, but secondly as the presidents of the board of directors of the for-profit limited liability corporations (LLCs) that run the labs. That may be a questionable conflict of interests, in which the LLCs are enjoying record profits from issues that deeply “affect national interests” (i.e., nuclear weapons) while the salaries of their “CEOs” (the lab directors) are exploding. Arguably the lab directors have not maintained public confidence in the decisions they make because of the general trend of increasingly withholding crucial public information. One example is the Performance Evaluation Reports that rate contractors’ performance and determines the amount of taxpayers’ money awarded to them. Those reports were publicly available until 2009 when the National Nuclear Security Administration (NNSA) began to withhold them, and became recently available again only after NukeWatch NM sued for them under the Freedom of Information Act.